The Titan swimming pool heat pump is a dedicated energy saving device which extractsheat from sun warmed air and transfers it to the pool water. 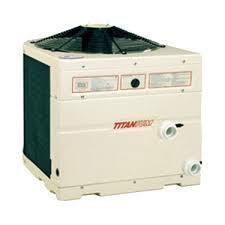 The Titan heat pump pool heaters transfer heat from the outside air to the pool water, rather than create heat as a fossil fuel or an electric heater does. This unique design difference can save pool owners up to 80% in heating costs compared to alternative heating systems. The Titan will typically provide 4 to 5 units of free energy for each 1 unit of energy consumed to operate. During the operation, air is drawn through the heat collector by the fan. The delicate aluminum fins abdorb heat from the air and transfer it to the liquid refrigerant passing through the copper coils within the fins. As heat is absorbed, the liquid 'boils' becoming gas. This is called 'heat of evaporation'. The compressor draws in the warm gas and compresses it, elevating its temperature considerably. The hot gas discharges from the compressor to the condenser coil inside the heat exchanger whereby heat is transferred to the pool water. The temperature of the water is increased as the heat in the gas is depleted. The compressor and fan require only a fraction of electricity to operate, compared to the heat energy that is transferred from the air to the water.